Little did artist Susan Winget and painters Mary Beth and Jeannie know that they were going to travel a long and rewarding journey when they started creating art to sell at the Atlanta Gift Mart in 1982. Thirty years later and a lot of hard work, Susan Winget is one of the top art licensing licensors in the U.S. 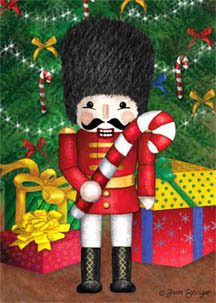 Her work is licensed for an amazing number of products including fabric, calendars, ceramic and melamine tabletop ware, all sorts of gift items, ornaments, decorative flags and paper products including party ware, gift bags, and greeting cards. The business started in Susan's garage but as the success of first selling and then licensing art grew, more space was needed. Thus, a small building was built on Susan's property. And, as it continued to grow a larger two story cottage was built in 2001. Find out more about the art, staff, and studio on the Susan Winget website. So why is Susan Winget art so successful and sought after by consumers? When I have a chance, I often query sales reps, distributors, gift store owners and managers about different artists work. In response to questions asked about Susan Winget's work, a sales rep told me that Susan knows what consumers want and creates art that sells products. A distributor told me that Susan's art is continually refreshed so that it is not dated like some other artists work and the themes are just right for the products. And, a gift store owner told me that products with Susan's art on it outsells the same products with other artist's art. I am sure that knowing what kind of art resonates with consumers has taken years and a lot of research. And, it looks like the Winget team has hit it right-on. The styles, colors, and themes have been refreshed and expanded over the years to reach out and appeal to more consumers. And, having an experienced team that creates a lot of art with different themes give manufacturers plenty of art to select. 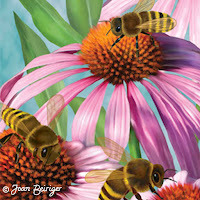 They do create an enormous amount of art because just for 2012, Susan Winget licensed OVER eight calendars. Gasp! That is over 96 images. The success of Susan Winget is also due to being represented by a top art licensing agency, Courtney Davis, Inc. They specialize in planning a business strategy for each of their artists by seeking out the right manufacturer partners and then working with them to develop products that sell. • "Tour of Susan Winget's Art Studio"
Discussing the start of the Susan Winget brand and a tour of the Winget Art Studio. • "Susan Winget Shares About her Art"
A discussion about different projects for 2012. • "KandCompany Susan Winget by BlueMoonScrapbooking"
Showing papers, stickers, and other items for scrap booking. • "CR Gibson's Brand's New Day :: Susan Winget"